Firstly, by default MySQL is installed only listening to localhost. It’s closed so that it won’t listen to your public IPs externally. This tutorial works both for Ubuntu, Debian and CentOS. To grant mysql remote access, we need to first of all open the MySQL to listen to external connections, and then, enable the user for remote networks. Before grant mysql remote access, it’s necessary to open the server port 3306. First, we will update our system and install Nmap. This utility shows the currently opened ports in the server. Now we will run nmap to make sure mysql isn’t listening in our public IP. Make sure to replace [server-ip] with your public server IP. As we can see, there is no server daemon opened on port 3306, and we need to configure MySQL to listen in our public IP. This will tell MySQL to listen in both localhost (127.0.0.1) and in the public IP of the server. After finishing, type CTRL+X to exit, and Y to save. Now you must restart the MySQL server. This restart process may be different according to your Linux distro. We can see 3306/tcp open mysql, which means that the MySQL port is opened and waiting for connections. We will get an error message because we haven’t granted the privileges to the user to access remotely yet. Now we will grant the privileges. Please note that even if the username is already configured for the localhost access, we will have to set a new password for it to connect remotely. You must replace [username] and [new-password] in this command. This command will ensure all the IP addresses can connect to the server using this username and password. We will explain after how to limit and restrict the access to certain IPs or networks. 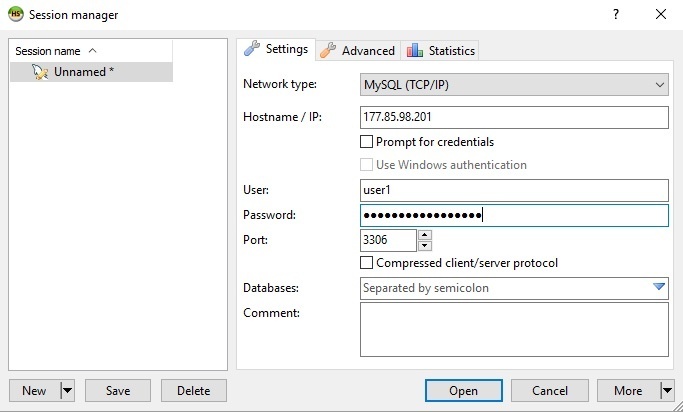 Now you should be able to connect to the remote MySQL server using the configured username and password. To restrict the IP or network, you should replace the % (wildcard) with the IP or block. To allow access from any network, without restriction, you should keep only the % (wildcard). This will grant mysql remote access to any IP or network. You can also allow such user to be able to dellegate and grant privileges to other users, by adding WITH GRANT OPTION to the end of the command. If you need to recover the mysql user password, you can also read this article.